It had been the perfect bivvy. Perfect isn't a word I use often. Sometimes I think to use it but I mostly stop short. There always seems to be something, some small detail, that lowers the score. Right now, no matter how hard I try, I just have to award full marks. The contrast with the night before couldn't be starker. Wet had been swapped for dry, cold for warm, lumpy for plush and, best of all, oppressive view obscuring mist for moonlit long views over tiers of mountain. Mountains rendered in monochrome, majestic and unworldly. Breathtaking. Everybody should see this at least once. Nights like these, though few, are the hard earned payback for every bitter second of the wet cold discomfort that bivvying so often brings. On nights like these tents and tarps, shelters in whatever format, are more than just superfluous, they kill the joy. Yes, I've heard all of the arguments, tents doors can be left open so on and so forth, but a three-sixty view, a front row seat in the theatre of the heavens, the feel of the breeze across your face, the smell of the earth, a sense of what we are; apes in pants, just can't be got any other way. I do this to be out and no matter how you look at it a night in a tent, or even a tarp is, albeit in a small measure, a night in. I'd spent the first part of the night just lying and looking around. Warm and comfortable. Drinking it all in. The moon full, round and gleaming silver, had tried her best to get me out of my bag taking photo's but I'd resisted. This was the ultimate in me time. The clutter of 21st century technology wasn't welcome. Then came the pondering: how much of Scotland is now above me? Are we now the highest people in the whole of the British isles? 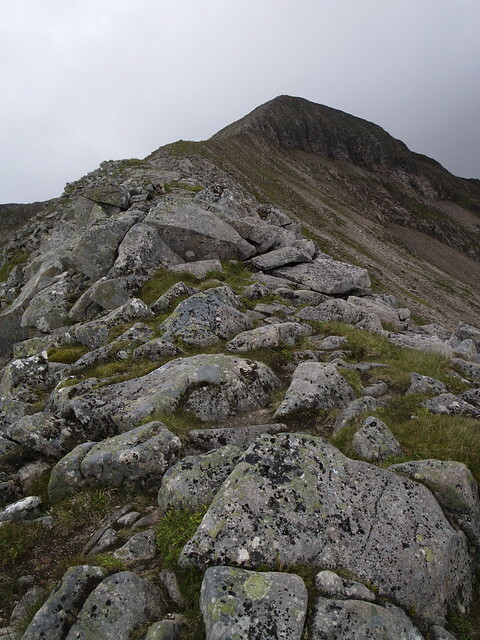 Aonach Beag is the seventh highest surely the odds are good..... I can't say how long this lasted but at some stage sleep must have clubbed me from behind. Ultra awareness had been replaced by a deep black nothing and the next thing I knew it was early morning and I was awake. All at once fully awake. The morning brought mist. Gone were the views and back was an awareness of the task in hand. 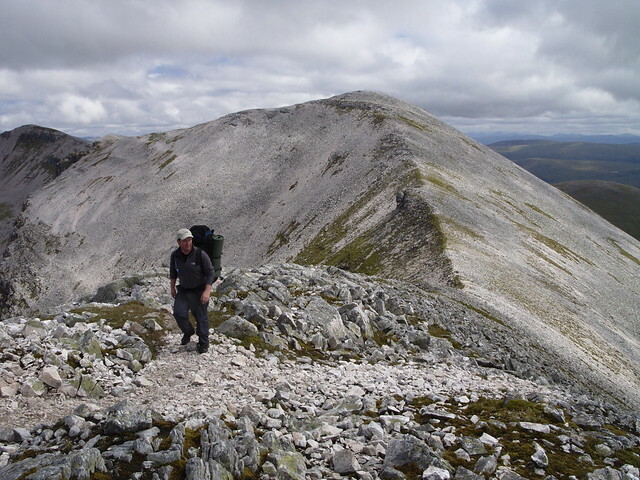 Over the Aonachs on to Carn Mor Dearg and then the Ben. 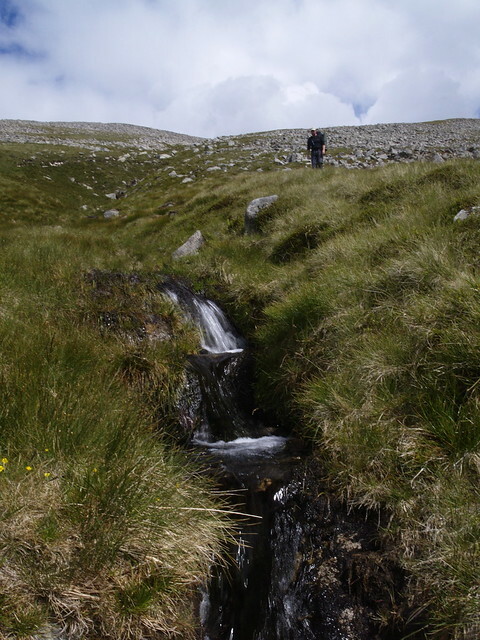 Would we be able to find that problematic descent to Coire Giubhsachan in mist? Is my compass work and pace counting good enough to get us past five finger gully in bad visibility? 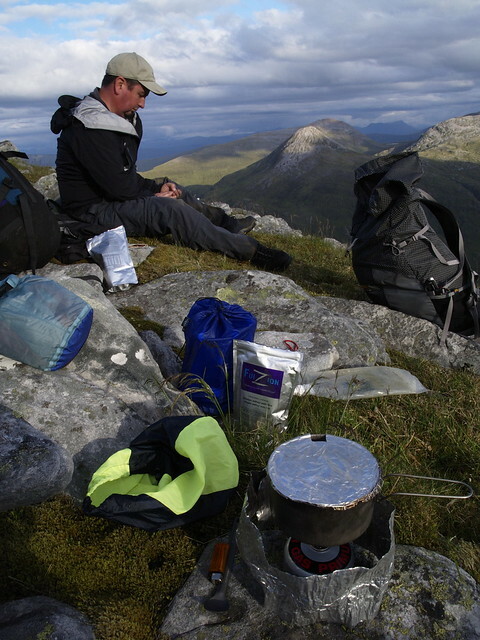 Sweet muesli, strong coffee, pack up, one last glance at what might be the finest bivvy in all Scotland and then we're off to find out. 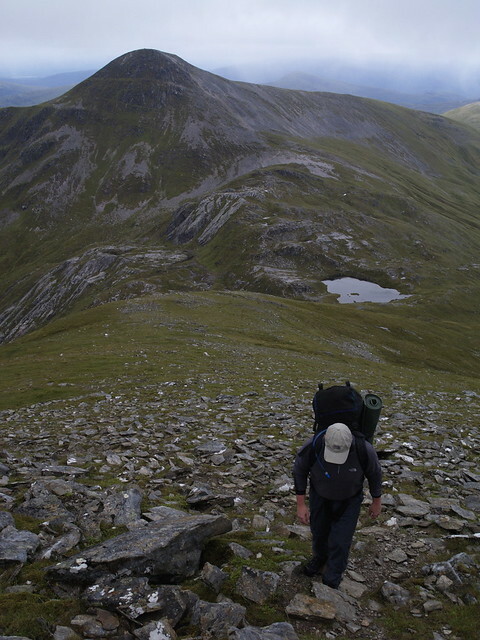 The day starts with a climb, up the last few metres of Stob Coire Bhealaich. Then, instead of following the North East Edge we walk on autopilot, following a use track, allowing it to pull us South of where we really want to be. 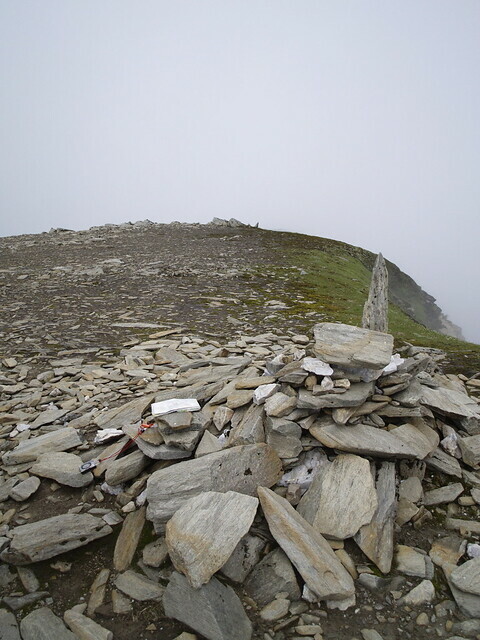 Then comes the realisation, a few moments effort to relocate and finally a long gradual climb to the ramshackle cairn on the summit of today's first Aonach and back onto the planned route. If this is the only error we make today I'll be a happy man. 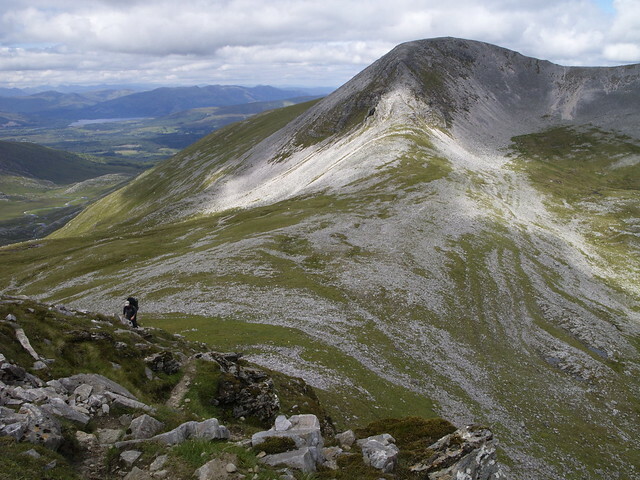 Some more down, in places scrambly, is followed by a wide saddle and then a shallow climb up onto the shoulder of Aonach number two. En route we pass tiny remnants of Scotland's permanent snow. Once on the top there's a temptation to keep on over the wide grassy plateau and bag another summit but at worst I'm a bagger in denial and in any case I want to avoid any potential view of the ironmongery of the ski centre. Instead, I take a rough bearing and head off in search of the little cairn marking the way off. We head too far North of West but as we walk we see a figure heading our way. A lone walker, travelling with a day pack and odds are he's doing our route in reverse. We stop to chat. The way off is steep but doable, the jumping off point is more that way than that, our new found friend has been over the Ben and CMD and later in the day intends to cycle over to Aviemore in his pursuit of all the four thousanders. Luck wished we follow the welcome redirect, pass the little cairn then step off exposing ourselves in an instant to the forty three degree slope that will keep us occupied to the next bealach. There's a path of sorts but it's heavily eroded and diffuse in parts where, to avoid the worst of the looseness underfoot, alternatives have been sought. All points of contact, hands feet and arse cheeks are put to use. In places resorting to a summer glissade over short stretches with neither foot, hand nor arse holds, short on style but long on effect. Down we must and down we go. The steepness is relentless and holds right down to the bealach but once at the bottom we're in another world. Grassy, sheltered, marked by mans hand. Who would come here to build a wall? This would've made an excellent camp had we had the steam to carry us over the Aonachs the evening before. As promised by Townsend, it's pleasant here and there's a water source to boot. Right now though, as we sit down to refuel, soaking up the first rays of sun to bake through the drifting mist, we agree that it would've been a poor substitute for last nights room with a view. 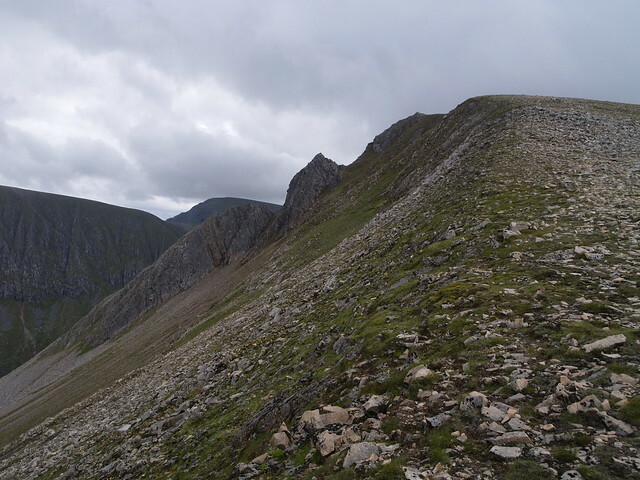 After a brief pause we turn our faces to the toe of Carn Mor Deargs lovely East Ridge. The bit in front of us is steep and scrambly. We decide to go through the back door and walk a little way North before attacking a shallower line up the Northern side. Shallower but still steep. All things are relative. Hands and feet carry us from boulder to boulder, block to block until at last we can turn west and follow the line of the ridge. Our timing is one again just right and we are rewarded with views. The ridge is a fne one providing a sense of exposure but nowhere scary. Walkable stretches are seperated by easy scrambles and the whole is technical enough to keep you occupied and strenuous enough to excuse a pause to catch breath and take in the view. We pause often. The view back across to Aonach Mor catches my eye more than once. From nowhere on the ridge does the line we followed off the top look doable. As we climb the whole curving length of the CMD arette comes gradually into view. It's awesome. Inviting and intimidating all at the same time. Then comes the Cairn and another excuse for a break. 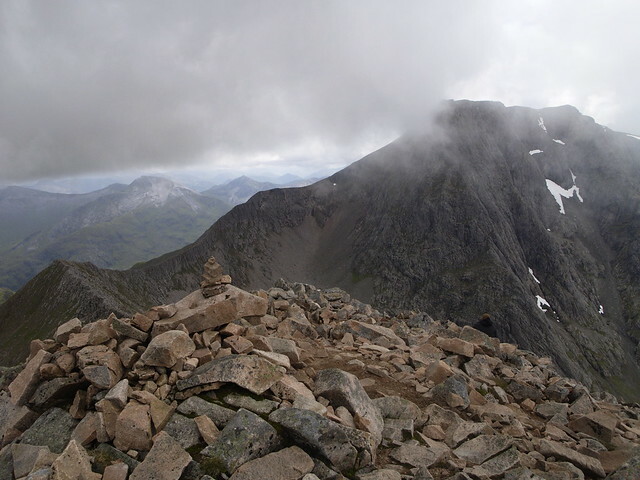 We sit next to the little pile of red stones atop the big red pile of stones break out the stove, brew up and just sit gawping open mouthed over Coire Leis, at the huge East face of Ben Nevis. I've never thought Ben Nevis a befitting mountain to hold the title of Britains highest but then I've never seen it from this side before. This is a special place indeed and at once I feel genuine shame for having doubted the pedigree of this mountain. For the most part, on this trip, our timing has been uncannily good. Now though, we've reverted to form. 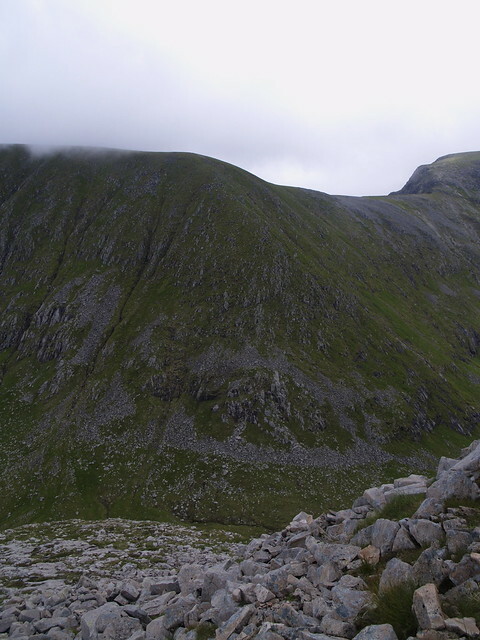 It's now two in the afternoon and instead of having the arrette to ouselves, as would have been the case had we started the day at the foot of Carn Mor Dearg, we're passed by a string of walkers heading up form Coire Leis, all intent on invading our ridge. Nothings ever free. Our perfect bivvy is now costing us dear. Now to make the last decision of the whole trip and one I never thought I'd hesitate to make. Start out on the ridge and there's only one way off; over the Ben. The conditions are great. Close to perfect. 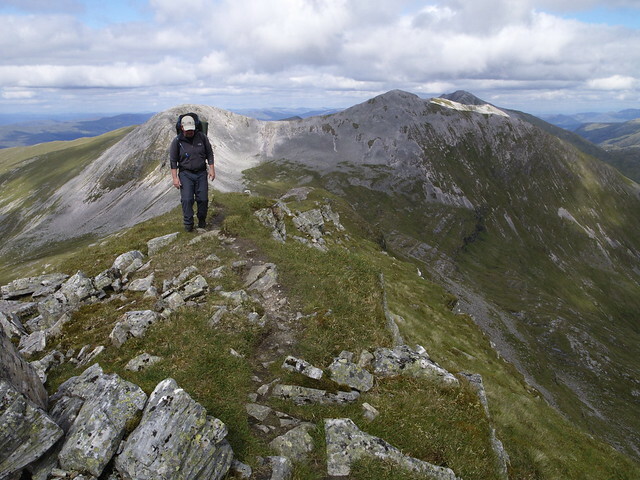 A kilometre and half of what may be the most beautifully situated ridge in all of the UK stands before us and a hundred and fifty metres of down followed by just shy of three hundred back up will put us on the Ben. But do we want to stand in the queue? I'm not sure. The pull of the arette is strong but, to my surprise, great surprise even, I wonder if I should save it for another day. Start out early and get it for myself? Do it fresh heading out the other way? I never relished the idea of thirteen hundred metres of knee beating down over the tourist track but that was always just going to be the price to pay. Iain doesn't like the idea of the three hundred metres back up onto the Ben on tiered legs. We take a moment more to talk through the alternatives pack up one last time and turn North. North not South. The rest of the afternoon is spent shambling over Carn Dearg Meadhonach and Carn Beag Dearg looking left over Coire Leis and right over the endless West face of Aonach Mor, then picking our way down over rough ground to the Allt a' Mhuilinn. 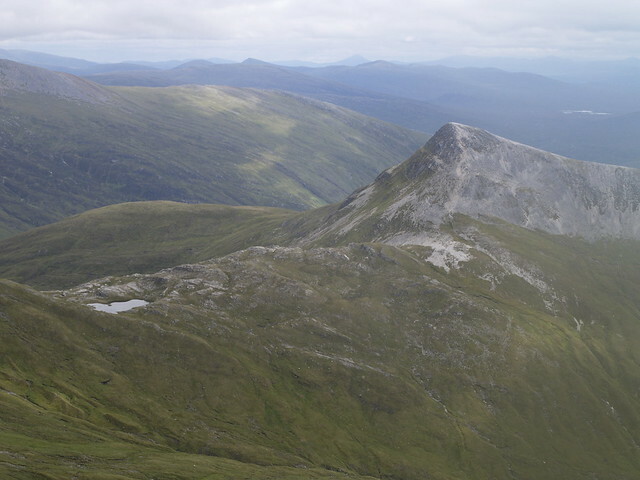 We then pick up the track around the back to Loachan Meall an t-Suidhe and slump down the half Ben. The path down very nearly takes all the fun out of our last hour on the hill. Nearly but not quite; the promise of beer hot food and a bed at the bottom does much to make good. The night was rough. Already, before it'd really begun, when we were still lying around in waterproofs, a shift in the wind had forced us to run out and re-pitch. Even then, even with the low end facing the action and catching much of the driven rain, the wind had had free passage under the roof. With two under the Grace a full-on bivvy bag doesn't fall under the category "unnecessary luxury". Fortunately we'd both packed one. My event cocoon kept me nice and dry but I'd still been surprisingly cold. I appeared to have found the lower comfort level of my lightest bag again and had spent half the night in half sleep deliberating whether or not to do something about my too cold legs. Only when forced to make my first morning call had I found the motivation to reach for my little down shirt and shove it into my bag around my legs. In comparative warmth I'd then been able to find some real sleep. The plan had been to rise early and get onto the tops before the first of the day folk but we'd lain long, peering through the triangle at our feet, watching subtle variations of shimmering grey. The shade of grey that doesn't inspire action. 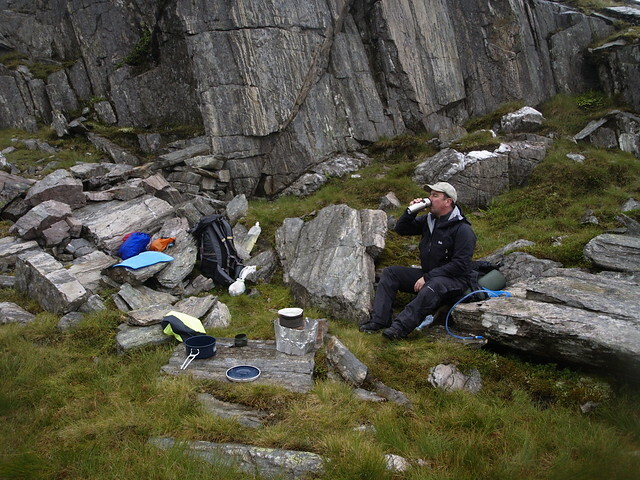 Now having packed up and returned to breakfast in the shelter of our betabled bluff, sitting with a strong cup of via, we nod an unwashed acknowledgement to a fast moving hillwalker on his way up to take our prize. 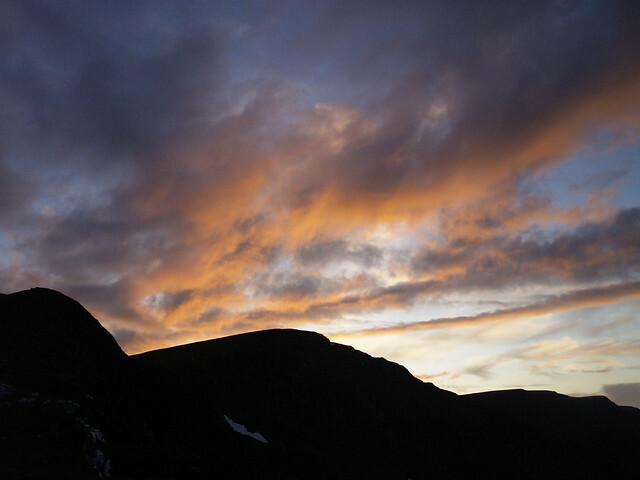 Tea we may be missing but coffee we most definitely aren't and our hill day starts in earnest at around eleven with a caffeinefuelleded, steep assent onto Stob Coire Claurigh. The MWIS had promised clear skies and good views in the afternoon. Right now I'm thinking that might turn out to be another of their habitual lies. 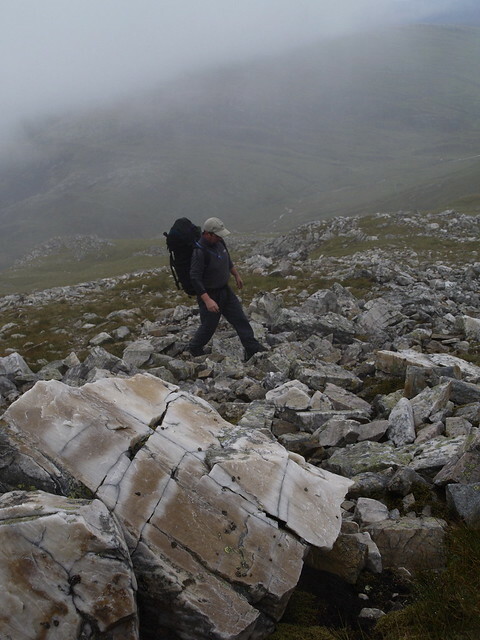 The climb is interesting, first over grass, then over bands of quartzite boulders, big lumps of geometric perfection, and then a little rock hopping over smaller debris. My soggy shoe of the day before is, to my surprise, dry. I realise I feel good under a light pack with light footwear. As we climb the view of last nights pitch opens up, on a drier, clearer night it would've been a very special place with views East and West. As nice as the view back down is what I really want right now is a view up but that's still awaiting shipment. Without a single false horizon we find ourselves suddenly at the summit and take a break at the cairn. As we sit we're rewarded with the view east but the centre point of our chosen route, the Grey Corrries ridge appears to terminate abruptly at a wall of cloud just fifty or so meters to the West. A muesli bar fatter I swing my pack onto to my back and as I do so witness a real life, 21st century miracle. Something, the sun, the wind, my fiercely determined look as I sight off to confirm the direction we need to head off on, has given the cloud cause to run off in fright. In the time it takes to draw three breaths almost the whole length of the ridge comes into focus. Well, it has now gone twelve and the MWIS had said afternoon after all. What follows is pure joy. 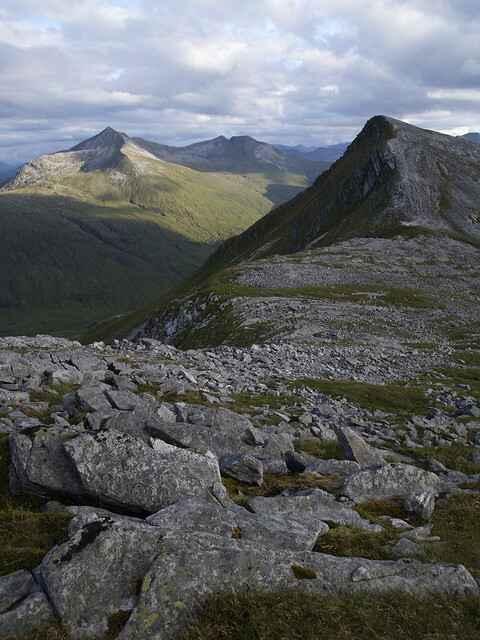 Seven kilometres of ridge, virtually all of it above a thousand meters, nowhere frighteningly exposed, nowhere calling for teeth and nails, almost everywhere walkable and where every step provides a new perspective on the sublime highland landscape. To our North the big scoops of the Scree filled corries from which the range gets it's name and further on the broad inhabited Glen Spean forms a mid ground to bands of hills, stacked one on top of the other, in long succession. It feels strangely good to be reminded of my insignificance again. To our South and West run Coire Rath and Glen Nevis, each dissected by a thin, shimmering silver ribbons, the latter defining the Northern edge of the Mamores. Big, spectacular looking hills concealing a ridge walk which would give this one more than a run for it's money. It seems I could reach out and touch them from where I stand. Trace the line of alternative routes mulled over these last weeks but locked away for safe keeping. I already know I`ll be back. To our West, beyond the dog-legged line of the Corries, first the massive wall of the Aonachs, the smaller big one and the in fact bigger little one, and then the Ben. 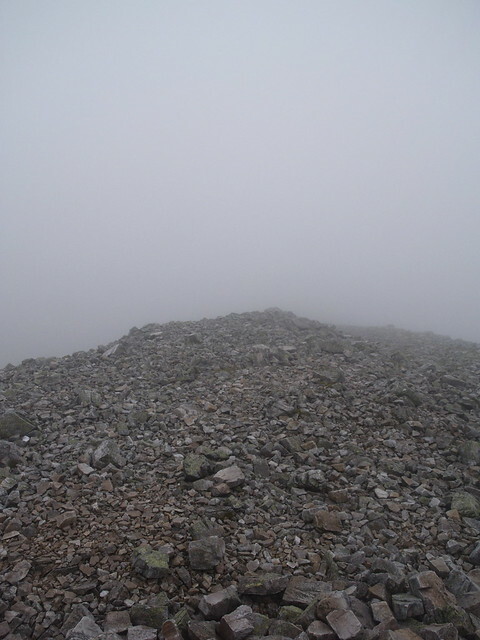 The highest point of ground in Scotland, in the whole of the British isles, and a goal of sorts of this route. The plan would have us on other side of the Aonachs by nightfall but all that lies somewhere in the future. We may have started late but schedules are for another day. Now we take our time, stopping to look, stopping to snack, stopping to lunch and between the breaks reeling in the peaks; Stob a' Choire Leith, Stob Coire Cath na Sine, Caisteal, Stob Coire and Laoigh and Stob Coire Easain glide by under our boots. Then comes the steepest and deepest descent of the day so far, at times with hands and feet,that puts us momentarily under the 1000m line and then back up. Somewhere we cross a transition, grey becomes green, and we're climbing on steep wet grass up to the top of the bigger Sgurr Choinnich. As we drop to the saddle we appear to be flagging and the future snaps back into focus. 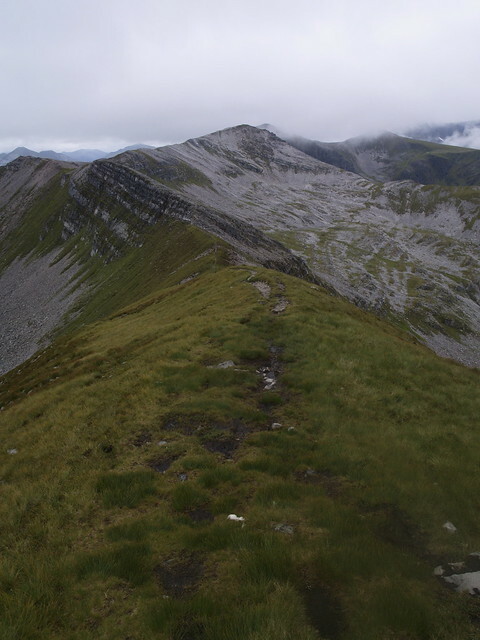 Once we're over the next top we'll have reached the end of the ridge and be forced to loose a lot of height only to have regain those metres, and more on top, to get onto the Aonachs. The days goal is starting to look like a big ask. The first contingency, a bivvy at the next saddle, the bealach under Sgurr Choinich Beagis not a preferred option; it'll leave too much over for tomorroww andalthoughh we may not have the whole pitch in our legs we have more than this. We think, confer and decide to save some of the climb still in us by contouring around the peak, going straight from bealach to bealach. Neither of us baggers the decision is painless. The traverse starts easy, just follow the sheep-blazed trail around the Northern side, but later, on the North West slope, gets steep and requires care. Still, we make the bealach and, perhaps, with greater reserves. Iain follows me in and as he crosses the level ground towards me it seems his head's down. It's time to break. Break properly, fuel up! Out comes the stove for soup. Soup gets followed up by a helping of apple and apricot compote, the the latter freeze died happiness, both guaranteed to suppress negative thoughts and put the smile back on your face. Daylight's plentiful and we rest a while, then and only then do we spread out the map to discuss options. Right now we've covered about two thirds of the distance but just over half of the climb. Our intended bivvy is just 4km to the west but between us and it there's 600m of ascent and then a wickedly steep 400m down off Aonach Beag. Tallied up that amounts to another three hours of toil. The call isn't that difficult to make. We're not staying here, it's too soon to lie down. We choose to carry on and see how far we get. On paper the climb in facing us now always looked like the crux. We look up at the slope in front of us and we can't see a line. There's no obvious use track and there, off to the right, is a big vertical wall I don't want to be on the edge of. Turnbull had written of an easy way off the Aonachs which must be over there off to the left but that's a half a kilometre out of way. We set off not sure what where we're going to head up hoping for a clearer view of two Gullies that look possible but as we traverse South I think I see a line. I talk Iain in to following me up a rock-hop running roughly North under a high wall in the hope that we can find a way around its back, the contours suggest it might be doable, and off we head. It's sweaty work, I feel good but Iain follows at a distance. As I get higher I become less certain of the route we've (I've?) chosen. I push on hard hoping that I can reccie the route and, if I can't see a way up beyond what's in view, save Iain some unnecessary climb. 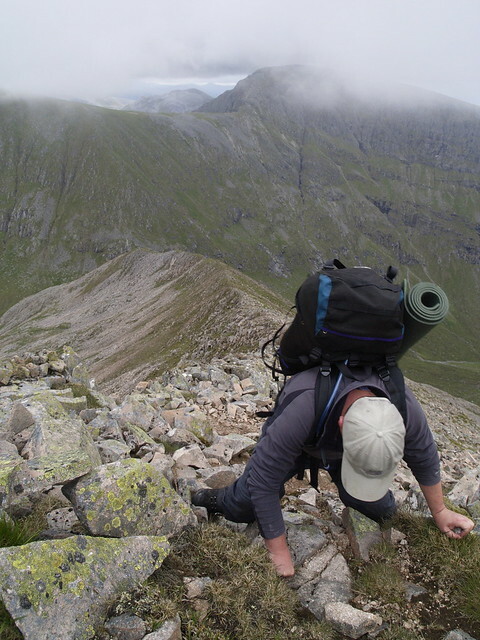 I reach the top of the steep and poke my head over to see a mess of crags and no clear line to follow further. I'm not sure, so I make the call and wave Iain back down in the understanding that I've probably just burnt any chance we had of making the other side of the Aonachs. Another fifteen minutes of backing down and I'm standing with Iain scanning the hillside again. This time further over towards Sgurr a Bhuic. There are two gulleys above us. One looks nasty the other, to me at least, looks doable. I again set off ahead of Ian to have first go. 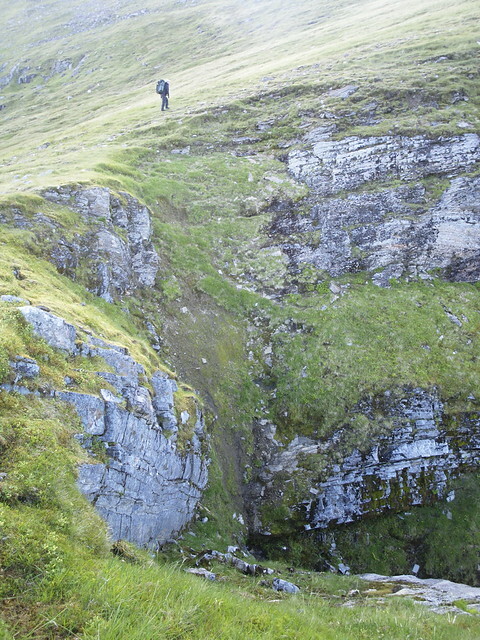 It's steep and underfoot is a mix of wet muddy scree, wet grass and wet moss, but I find enough purchase and climb. Comfortably enough, first in the open and then under an impressive overhang. The last few meters are a bit airy but there are good holds and, popping my head over the crest for the second time I get an eye full of the wide Southern slope of Stob Choire Bhealaich. A moment later I'm sat on the edge looking back down, king of the apes. As Iain approaches I can see he's not happy. The climb demands effort and back slipping on tiered legs is sapping nerve. There's an exchange of words centred for the most part on my route finding ability but also on the disadvantage of short legs. It's time for another break already. This time curry is called for. We sit on our high perch. Long views illuminated by the rich light of early evening accompanied first with the raw of burning gas then with the burn of chilli. Little gets said. Little needs to be said. Curry wolfed and drink drunk thoughts turn to what now. We won't make the planned camp, that's a given but what to do? Bivvy here? Drop down or carry on up? Our luck with the weather looks set to hold. Down looks to present lots of bivvy potential but possibly with insects thrown in and certainly with a stretch of back up to start the next day. Up is the right way but how far before we find a lie? Either way we need water so I drop down to find a source. Looking around, regardless of the promise, I see no dry flats. Up it is. We pack up the mealtime paraphernalia and saunter off up the slope planning to lie down at the next opportunity. Passing by the top of our ascended gully I get an eyeful of impossibly steep. Impossible it can't be, after all we're stood here, but from this perspective I have to agree with Iain, It looks fiercely steep. Perspective is, as ever, everything. 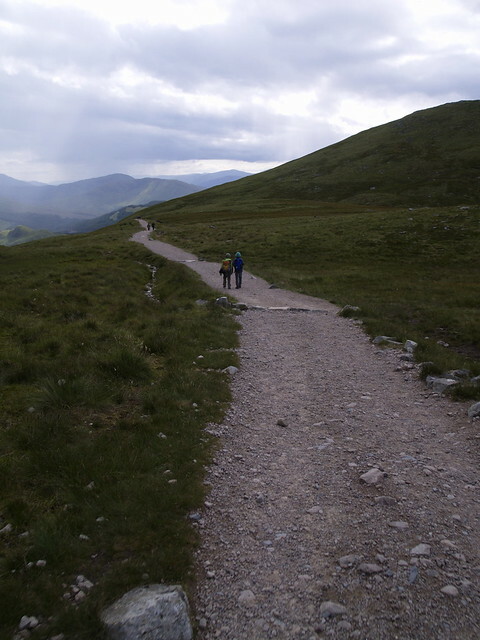 We continue Northwards until we hit the path coming down of Aonach Beag. Passing a small cairn, presumably marking the drop off for the normal descent to the Corries, and presumably sited a few meters away from where I popped my head up on the first aborted attempt to get here, we turn West and are once again heading in the general direction of our end goal. A few steps further I spy a small shelf, well sheltered and a comfortable lie for one. I offer Iain first dibs and head on further to find a second one. I end up walking a half kilometre or so further and all the time the only suitable place to stretch out appears to be in the trough of the deeply eroded path. The thought of being woken by an early birds boot doesn't appeal so I bite down and persevere. Not for long though. A few strides further and there it is. Sometimes, rarely but it does happen, you cast your eye over something and you just know its right. 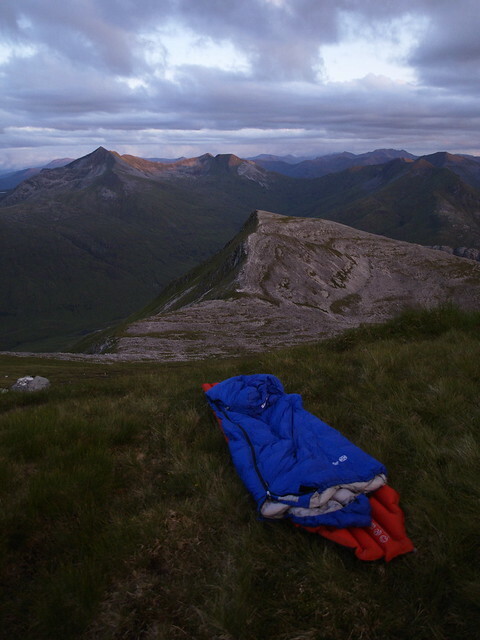 Right there, just a few metres shy of the top of Stob Coire Bhealaich, is the bivvy of the gods. Right there, with a shear drop to the North and an endless view South is a flat patch of cushion soft grass, plenty big enough for two, complete with shelves and bedside tables. On another night with weather coming in from the North or South this would be a bad idea but tonight it's perfect. It might not be where we'd planned to be but right here is where I want to be. Dumping my stuff I head back down and tell Iain the good news: that he's got another half a kilometre to cover before bedtime.